Charming 3 bedroom/3 bath chalet style home only a 3 minute walk to intermediate slopes at SkiBeech. Great for 3 couples. Located beside a lovely pond providing guests the opportunity to gaze out over the mountains or water. New 50' Widescreen plasma TV, Premium Cable TV Movie Package. Home is professionally decorated and very comfortable. Short walk to Beech Mountain town center; home of Fred's Mercantile General Store, Restaurants, and miniature golf in season. Two story home, upper level having the Master Bedroom and Bath, Kitchen, Den w/Fireplace, and Washer/Dryer, and outside deck with gas grill. In addition there is a small cozy loft with a 3/4 bed that children love. Lower level has 2 Bedrooms, each with Private Baths and lower deck with Ski Rack, looking over the pond. Two hundred yards or less from slopes, so you never need to drive your car to ski. Great for letting family members come and go from the slopes as they wish. Ski Beech offers night skiing, so adults may let children ski by themselves at night if they wish to go out to dinner and the kids can walk back when ready. Credit card payments to Paypal accepted. Susan & I are so glad you enjoyed your ski vacation and are happy you liked our house. I enjoyed talking with you and would like to hear more about the movie industry. We look forward to having you back. The house was very convenient to the slopes and could not be any better for ease of getting onto the slopes! Had plenty of space for me, my husband and both kids. It is an older home so a little short on closets but the kitchen was updated and the house has been kept up well. Beds were comfortable! The only reason I did not give it 5 stars is the downstairs bedroom has a wall unit space heater and it was hard to regulate the temperature. We also had our son’s tennis shoes sitting too close to it and it got so hot it shrunk up the inserts in his shoes and it melted the rubber on the front of his snow boots(they were accidentally touching it). We probably should have been more careful. The bathrooms could use some updating. They were very clean though. This is an awesome house if your main goal is to maximize time skiing! I would definitely stay here again! Thank you for your review and your kind remarks about our house. We hope your knee is feeling better and that you will want to return soon. Thank you again for renting our house. Perfect for a Family ski trip or Vacation. Easy access and well equipped. Perfect for 4 people and a long weekend. We are so glad you enjoyed being our guest. We hope you will want to return soon. We drove up from Florida to enjoy the snow over MLK weekend with our boys (11&12 yrs old). The house was beautiful and had plenty of room with 3 bedrooms and loft (loved having 3 bathrooms too!). The furniture, bedding and towels were of great quality. The décor looks rich and very stylish, never would guess it is a rental or that it allows dogs. The home was well stocked with items to get us started (paper goods, wood, etc). It was record cold (-12 degrees and windy) and the home was as warm as we wanted it to be in each room and well insulated and quiet. We loved that it was not a busy road with a lot of traffic, and enjoyed taking the dog out and walking down the road to the slopes to meet the boys. 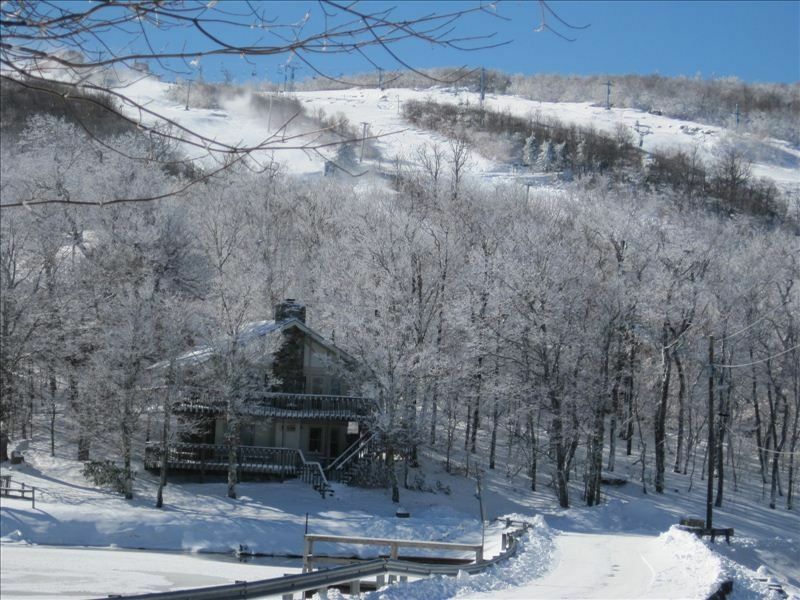 It really is a short walk to the end of the block, and you can hike down a little trail and jump onto the slopes if you are experienced and comfortable on that terrain (would not recommend for new skiers or small children). Kitchen was well stocked with pots, dinnerware, glasses and all the utensils we needed- even when we had another family of 4 join us for dinner/lunch. Plenty of room for the kids to play, watch movies or just relax. It is a 5 minute drive to the Beech parking lot, and 2 mins in the other direction from Freds Mercantile and the sledding hill. Perfect location and easy to get in and out w/out 4 wheel drive- even when we had snow and ice. Darrell was very accommodating, friendly and helpful giving directions, recommendations for eating and shopping and having the home ready for us. We will definitely be back and highly recommend this rental. One of the best we've ever rented- no complaints or recommendations to change a thing!